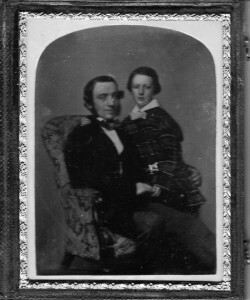 Patrick Plunkett and Patrick Cranny from Meath and Carlow respectively, met in Dublin through their wives, who were first cousins, whom they married in the 1840’s. Both of the women had money of their own which enabled their husbands to go into business, first in leather and shoemaking and then in building on the south side of Dublin. 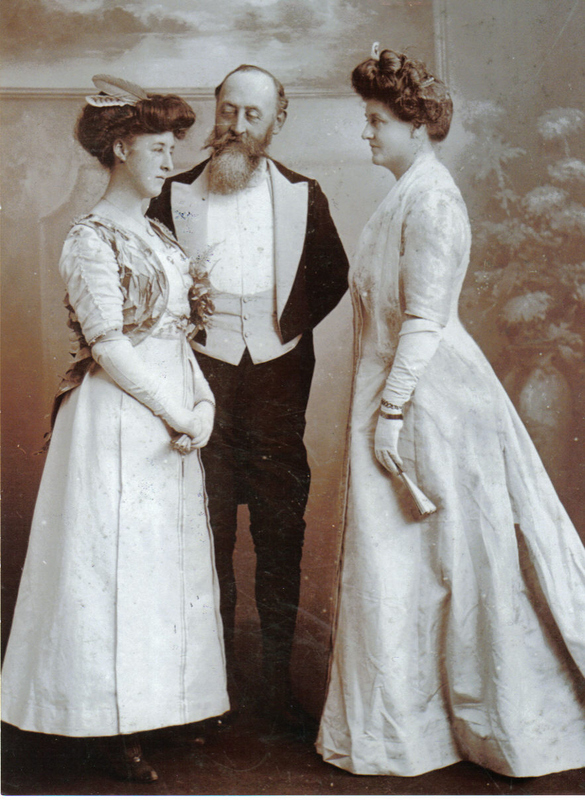 This in turn created considerable property-based wealth and when Plunkett’s son and Cranny’s daughter, who were second cousins, married in 1884 that wealth was united and ultimately vested in them and their children. Patrick Cranny was born in Borriss in Carlow in 1820 and he left Borriss, probably in the mid 1830s and went to Tralee to work as a journeyman shoemaker. Tralee had become a thriving town – the elegant Denny Street was completed in 1826 and Impressive public buildings such as the courthouse and the Town Hall appeared in the 1830s and 40s. In Tralee Patrick Cranny met and married Maria Keane, a granddaughter of Dan and Abigail O Sullivan who had twenty-one children and seem to have been prosperous enough because all the children and grandchildren appear to have had money of their own. It is possible that these were the O Sullivans in the directories who were harness makers and carriage builders. Maria Keane’s father,Black John Keane, was sufficiently well-off to bring Maria and her sister, Sarah and brother, George on an extended holiday to America in the 1830s. 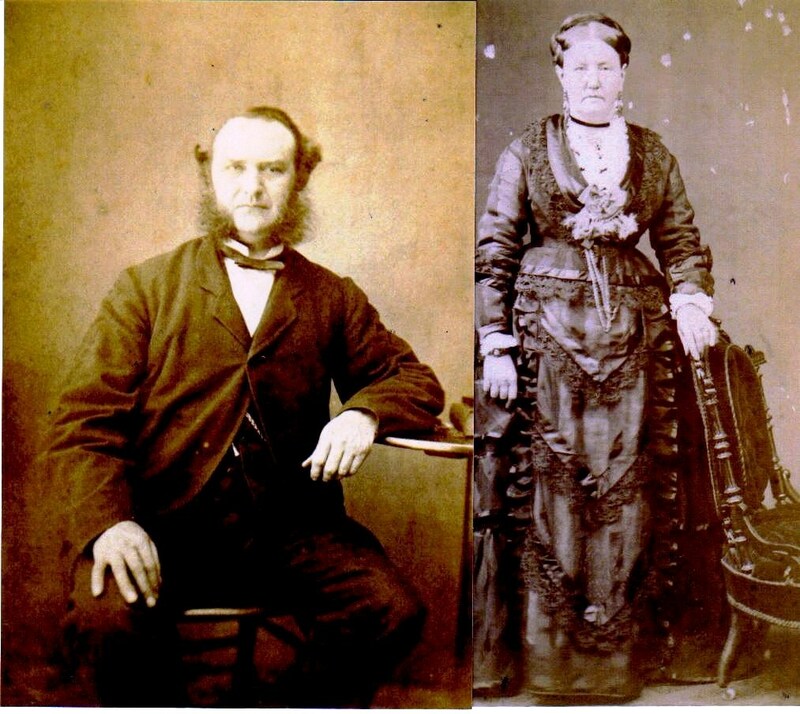 Patrick and Maria Cranny came to Dublin in 1842 and, with the benefit of Maria’s money, set up a shoemakers’ shop on Lime St. between what is now Pearse St and the Quays. The following year they moved to 74 George’s St where they set up their business making boots and shoes at a time when there were over five and a half thousand shoemakers in Dublin. They also owned the ground and premises and lived over the shop. 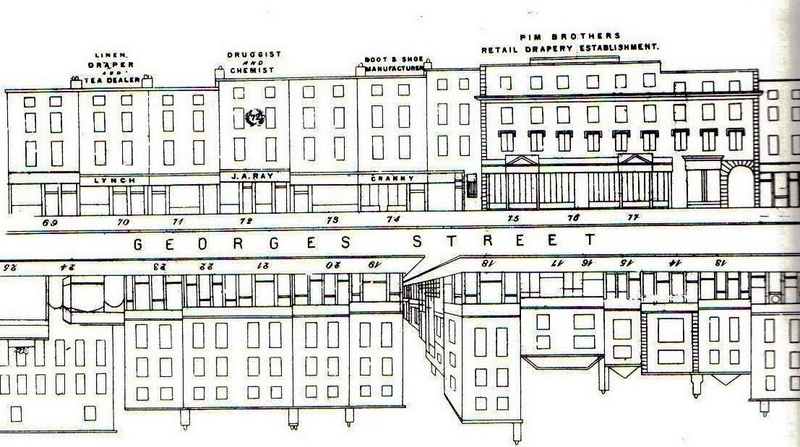 Pim’s, Dublin’s first department store, and Cranny’s shoe shop can be seen on the fine drawing of George’s Street in Shaw’s 1850 Directory. Pim’s took over their shop when the Cranny’s moved to Donnybrook but Pim’s paid ground rent to them for many years after. Patrick Cranny’s was a high-class bespoke trade from which he made a good deal of money. Many of his customers had their own hand-carved wooden lasts kept for them in the shop so that they could order boots and shoes without having a fitting. The shoemaking tools and much of the leather were brought in from Florence and some of the workers were also Italian. In the back of the shop there was a forge on which were made the nails, and tips for the toes and heels of the strong boots. When the workers in the shop needed a meal, steaks were brought in from the local butcher and cooked on the forge. The quality of the workmanship in the shop must have been remarkably good as in a few years they were able to add Bootmakers to the Lord Lieutenant underneath the name. Geraldine Plunkett remembered being lifted onto a table to be measured for her boots when she was about three years old in 1895. They were made by a man named Mahoney, the last of her grandfather’s men, after they had closed the shop. She said that they were soft Moroccan leather, fitted perfectly and never wore out. Maria Cranny had a cousin in Dublin living and working close by, Abigail Noble. Abigail was also an O Sullivan from Tralee who had married John Noble, an Italian or half Italian leather worker, in the 1830’s. They had a leather shop at No. 2, St Mary’s Abbey, just around the corner from Capel Street When their children were adults they also had shops, their son John, on the corner of Abbey Street and their daughter Elizabeth, known as Bess, on Upper Stephen’s Street around the corner from George’s Street, a shop which she took over from her parents. John Noble was Protestant and wanted Bess to marry a Protestant friend of his but his wife, Abigail, a Catholic, wanted Bess to marry a Catholic man named Murphy who lived in the area. While John was away on business Abigail arranged for Bess to marry Murphy but when John returned he dragged Bess back home and effectively dissolved the marriage. As her father he was her guardian until he gave her away to someone of his choice. Shortly afterwards Mr. Murphy took ill and was dying. Bess wanted to nurse him but her father would not allow her. Murphy left her everything and Bess bought No. 1 Aungier Street, left home, set up her own shop and never spoke to her father again. She sold French and Italian leather, travelling in France and Italy and buying for herself. She spoke both languages well but particularly Italian and with her sallow skin and looks inherited from her father, she was often taken as Italian in Italy. She had a good eye and was a clever businesswoman and made a real success of the shop. Geraldine Plunkett (her granddaughter) was told in 1916 by an Essex St. locksmith that she was always known locally as Bess-Noble-with-a-shop-of-her-own. Patrick Joseph Plunkett came from a farm adjoining the demesne of Killeen Castle, the home of the Earl of Fingall, in County Meath. Born in 1821 he was a distant cousin of the Earl’s and acknowledged as such but he didn’t consider the relationship to be of any importance. The Plunketts had been in Ireland from at least one hundred years before the Norman Invasion and succeeded mainly by marrying money and land and giving good service to many kings. Patrick Plunkett had little interest in this aspect of his family but he, like most Plunketts, was very proud of being a close relation of Archbishop Oliver Plunkett who was hanged, drawn and quartered at Tyburn in 1681. (Oliver was beatified in 1920 and canonised in 1975). Patrick’s father died in 1844 and the Great Famine, which began the following year, rendered the farm useless. All 14 children, including Patrick, left home, dispersing to various parts of the world. Patrick was the only one who came to Dublin where he worked in a shop on Sackville St (O Connell St) and was probably apprenticed to a building contractor at the same time. He had certainly acquired two building yards, one in Werburgh Street and one in Golden Lane, by the time he met and married Bess Noble in 1847 after only a year in Dublin. It was now his name that went up over the shop Patrick J. Plunkett, Leather Seller and Post Office Receiver but it is obvious that it was not his ambition to be either a leather seller or a Post Office Receiver. Part of Patrick and Bess Plunkett’s marriage settlement was a mortgage on No. 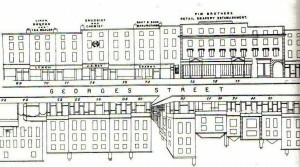 1 Aungier Street and No 11 Stephen Street, Bess’ shops, held by Patrick and Maria Cranny to enable Patrick Plunkett to set up in building. He and Bess kept the leather shop going but Pat was also doing building jobs here and there around the city centre including lowering the floor of Arnott’s by six inches overnight so as not to disturb business. However this was the beginning of the surge of development in the suburbs outside the canals, particularly on the south side and Pat Plunkett began buying plots of ground in Rathmines where the Earl of Meath’s estate was being sold off. Rathmines had been developing steadily along the main road from the canal for over twenty years and in 1828 the new Church of Ireland Church of the Parish of St Peter’s, Aungier St. was built on Church Avenue, facing up towards Upper Rathmines Road. Behind this church the 1837 map shows many sites, still empty and green with the occasional villa type house and small rows of country houses. In 1854 Pat Plunkett bought sites behind the church on what would become (in 1878) Belgrave Road. He first built three houses with Edward Henry Carson (father of Lord Carson) as the architect. Carson was a very good architect (he described himself as an engineer at that time) and Nos. 1, 2,and 3 Belgrave Rd are fine houses with full height ground floors rather than basements and the front doors are in separate porches, allowing more space in the reception rooms while the hallway itself has a half barrel ceiling with elegant moulding. The houses, although terraced, are also separated by these hallways. Carson’s other work includes St. Peter’s Church, Aungier St. (now demolished) a prizewinning terrace on Appian Way, Warwick Terrace, and the Town Hall beside the Royal Dublin Society in Ballsbridge. Although Carson was a fine architect he had an unfortunate habit of ‘cooking the books’. Pat Plunkett had kept his own set of books and he found the discrepancies, sacked Carson and never employed an architect again. This was not unusual; in common with other builders most of the houses Plunkett built were taken from pattern books. Plunkett continued to build on the same side of the road using a plainer, more standard design of two-storey over basement but the houses have their own quiet elegance. The top floor windows are small-paned but the hall floor ones have two large panes – new technology at the time. There is decorative plasterwork everywhere on the top floors (mass production was making this much easier) and fine marble and cast iron fireplaces. Double doors between the front and back hall floor rooms were again a standard design and the same pattern turns up in most of the houses he built, even those meant for the richer market. He put picture rails in all his houses and left space for bathrooms although he did not believe in them enough to actually install them. While Plunkett was building on the south side of Belgrave Rd., Patrick Cranny was building on the north side. This was a loose partnership and seems to be the only time they built on the same road. Patrick Cranny went into the building business because mechanization of shoemaking was increasing and he’d had to choose between that and getting out of the business. The features in Plunkett’s houses occur in many of the Cranny houses as well. Cranny certainly built nos. 21 to 26 Belgrave Road and possibly more where the ground landlord was Frederick Tanfield Stokes, Chairman of the Rathmines Township Commissioners for 30 year from 1847 to 1877. 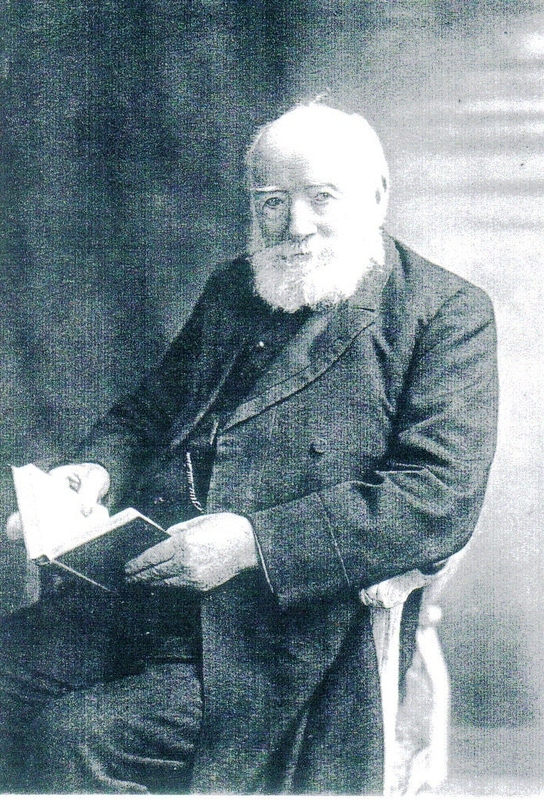 Stokes had strong views as to the development of Rathmines and was creating a retreat for the well-off from poverty, famine and disease in the city to a green, leafy area, mainly for Protestants and Unionists with virtually no housing for the poor or even the servants who were so essential to the new houses. Stokes was also building in many parts of Rathmines and elsewhere in Dublin and he was now building and commissioning houses on either side of Patrick Cranny’s set on Belgrave Road. It is possible that he put Cranny off but for whatever reason Cranny did no more building in Rathmines. 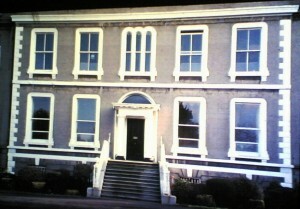 His next venture, in 1856, was in Ballsbridge, building on the Pembroke Estate. The Honourable Sidney Herbert, 1st Baron Herbert of Lea, ran the Pembroke Estate because his elder brother, the 12th Earl of Pembroke, took voluntary exile in Paris after a series of disastrous relationships. Sidney Herbert was Secretary at War in Peel’s Cabinet and was responsible for sending Florence Nightingale to the Crimea and for instituting reforms at the War Office after the Crimean War. His wife, Elizabeth, was a known liberal and philanthropist and she became an Ultramontane Catholic after Sidney Herbert’s death in 1861. His eldest son, the 2nd Baron of Lea and later, 13th Earl of Pembroke, was then only 11. It is unlikely that Patrick Cranny ever met Sidney Herbert, particularly since Herbert was up to his neck in the problem of the Crimean War when Cranny was signing contracts, he probably dealt with the Agent, but Herbert did have a hands on approach and the Estate was run under strict regulations and high standards with regard to construction and appearance and there was a concentration on long even terraces redolent of Georgian aesthetics. Lease dated the 5th day of April 1856 and made between The Right Hon. Sidney Herbert of the one part and Patrick Cranny of the other part …. All that lot or piece of ground situate at the East side of Wellington Road in the Barony and County of Dublin containing in front to Wellington Road aforesaid 50 feet in breadth in the rere 50 feet in depth from front to rere in the North side 305 feet and on the South side 306 feet 6 inches mearing and bounding on the North by ground in the possession of the said Sidney Herbert on the South by another holding of the said Patrick Cranny’s on the East by Wellington Road aforesaid and on the West by a Stable Lane… being the hereditaments and premises now known as numbers 23 and 25 Wellington Road in the City of Dublin were demised to the said Patrick Cranny from the 25th day of March 1856 for the term of 150 years at the yearly rent of £IO.15/ 0 and under and subject to the covenants on the Lessees part and conditions therein contained. The other holding of Patrick Cranny’s mentioned in this lease is Nos. 19 and 21 Wellington Road, 8th April 1856 and in that case, Agnes Browne is mentioned as holding the parcel of land to the South of Patrick Cranny’s. Waterloo and Wellington Roads had been laid out and opened for building in 1846 and their creation had been slow and steady. The Wellington Road houses still have a more Georgian than Victorian appearance and are set very deep in their plot of land giving a sense of a small estate. These are from 305 to 310 feet (a modern developer would have fitted in another road!) whereas the plots of the Cranny houses in Rathmines are only 150 feet from front to rere. A characteristic of the Pembroke Estate Ballsbridge roads is that they are linked by what seem to be long roads which consist only of the walls of the back gardens of the houses and the lane between. The only houses on Wellington Road known to be built by Cranny are Nos. 19, 21, 23 and 25. It is possible there are more but it is unlikely. Sometimes there is additional physical evidence which helps establish such things and in this case the fact that the roof design of No. 27, next to Cranny’s last house, is quite different, steeper pitch and different chimneys, so, despite the similarities of the house, it would appear to be the work of a different builder. In 1850, before all of this building in Rathmines and Ballsbridge Patrick Cranny had bought a plot of land on what was then called Bushmount Avenue (later Marlborough Road) in Donnybrook with the intention of building a house for his wife, Maria, as recompense for the use of her money to set up first his shoemaking business and then the building business. The development of Marlborough Road went in phases. 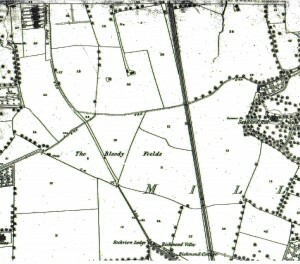 The 1837 Ordinance Survey map shows several separate terraces, probably the earliest of them is Thornbury Place , three houses (current Nos. 47, 49 and 51) which look like 18th century country houses. They are probably early 1820s and built by Thomas Millington, builder, of Temple Street and in the lease there is reference to the ‘new road’ – Bushmount Avenue. It became Bushfield Avenue in 1843 with the terraces having separate names, Thornberry (or Thornbury) Regent, Carlisle, Muckross and George’s Terrace. Dagmar Terrace, seven houses, beginning at Carlisle Avenue, is probably called after Queen Alexandra’s sister who married a Russian prince in about 1866 so the houses are probably that date. Bushfield Avenue became Marlborough Road in 1880 after the death of the Duke of Marlborough who had been Lord Lieutenant of Ireland from 1876 to 1880. The 1837 map also shows current Nos. 53 and 55 (they seem to appear as one house, not two) Nos. 4 to 16 (even) which resemble small demesne houses, the beautiful terrace of two-storey houses (possibly also by Thomas Millington) beside the gate of what became Muckross Park, the current Nos. 64 to 74 (even) and, between these last two sets, the 2.2 acres on which Patrick Cranny built his own house, Muckross Park. He and his family moved in there in 1862 and he built three houses beside the gate and then bought up all the land and houses which comprised the site around Muckross, including Sandford Avenue and Garden Cottages. Patrick and Maria’s four surviving children were now able, thanks to their wealth, to enter the professions. The first two did; John Joseph became a doctor, quite an eminent one, Gerald, called an architect but not necessarily qualified, and later a wine merchant but Frank was sent to Australia as a remittance man for embezzling £1,000 from his father and seducing the maid. 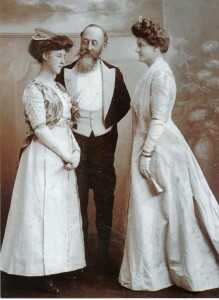 The Crannys daughter, Josephine Mary, married George Noble Plunkett, Patrick Plunkett’s son, after he had been created a Papal Count in 1884. Patrick Cranny bought the Muckross land in 1849 under the Incumbered Estates Act. It had originally belonged to Joseph Leeson, 1st Earl of Milltown and the builder of Russborough in 1741. The house Cranny built there was a villa-type, originally two-storey over basement with four good reception rooms, double doors between two of them, on the hall floor with a large staircase in the back hall with big drawers set into the side of it. This floor has good (mass-produced) mouldings everywhere and a decorative niche in the hall but it is interesting that although Muckross Park is intended as a fine family house, Cranny used the same quality and design of decorative elements in the more ordinary and much smaller houses he built on Marlborough Road twenty years later. The family part of the house had cast-iron fireplaces with marble surrounds, two-pane sash windows on the hall floor and four-pane sash windows on the bedroom floor. The basement, of course, was for the servants and the engine of the house but it is a generous size and more ground-level than basement with good windows giving it plenty of light. The approach to the house was a short, curved avenue surrounded by lawns and trees giving the aura of grandeur required by Maria Cranny and besides the gardens, paddocks and stables there were two conservatoies on the side of the house. The Crannys were strong Catholics, old enough to remember the advent of Catholic Emmancipation, and while the new Pugin and Ashlin Catholic Church in Donnybrook was being built, local Catholics could attend Masses celebrated in Muchross. Muckross, which was said to have been named for Maria Cranny’s Kerry connections, was made over, exclusively, to her in 1875. 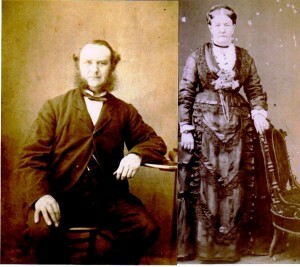 Patrick Cranny died in 1888 and Maria moved to 17, Marlborough Road. Maria’s granddaughter, Geraldine Plunkett, describes her as ‘Methodical, economical, competent, practical, sharp-tongued, domineering and religious’. 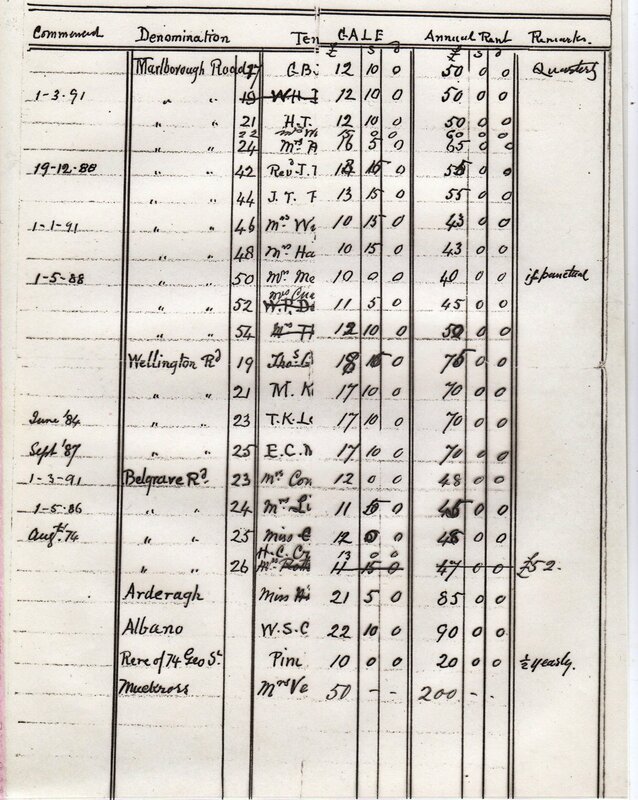 She inherited many of the houses her husband had built (sometimes only as a life-interest) and her rent roll of 1891 shows her organization and her prosperity. She had four houses on Wellington Road and four on Belgrave Road, nine on Marlborough Road and two detached houses on Eglinton Road. She also had ground rent from Pim’s on George’s Street and, of course, Muckross. 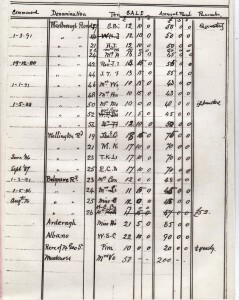 The annual rent per house from Marlborough Road and Belgrave Road was between £45 and £60, Wellington Road was around £70, Eglinton, £85-90, Pim’s ground rent, £20, half yearly and Muckross yielded the grand sum from Mrs Verschoyle of £200. This gave Maria an income of about £1,250 in 1891. In 1896 she agreed to sell Muckross to the Dominican nuns who had been educating girls for external university degrees. They opened a school and college in Muckross in 1900 but when University College Dublin opened in 1909 their college was no longer needed and the school continued. Having finished the south side of Belgrave Road, Rathmines, Patrick Plunkett, who was now living in No. 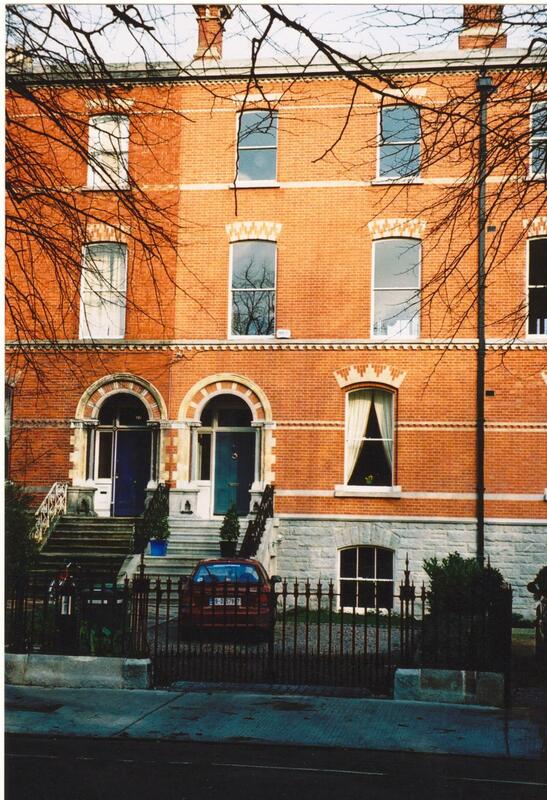 3 Belgrave Road, bought the adjoining site and began building Palmerston Road, a project, begun in 1863, which took over twenty years, several builders and a land exchange with Viscount Palmerston to complete. Plunkett built the first seventeen houses himself and later some other terraces on the road but much of it was leased to other builders who built anything from one to twelve houses in a great variety of styles – low and high-pitched rooves, plain to fancy ironwork, small and large-pane windows, elegant and lumpy design, terraced and detached and, in the case of the first houses Plunkett built, an unusual link between the houses which looks like a design for something else altogether and which facilitates a driveway though under the link to the stables at the back because there was no lane behind those houses, only a piece of land for which no title was ever found. Most of the houses, like Plunkett’s and Cranny’s, were intended for letting to the upper middle class professionals, civil servants and those with private income but it was also common for a client to commission two houses from a builder, one for himself and a second beside it as a source of income. In his will of 1905 Patrick Plunkett gives the value of No. 8 Palmerston Road, two-storey over basement, one of the houses he built himself, as £700 which is probably the average value of these larger house but he built every type and size down to the small two-storey houses on Killeen Road. 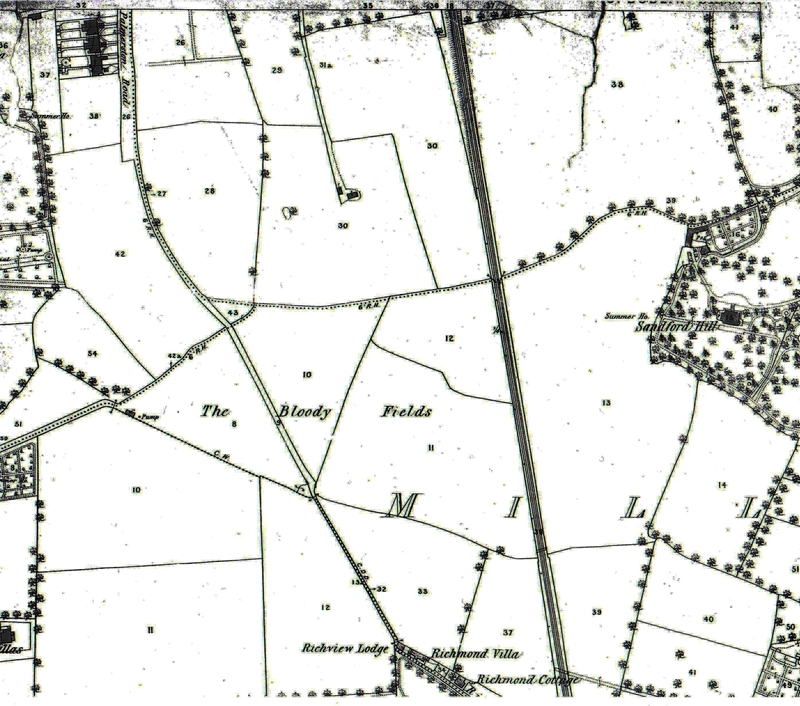 In 1870 Patrick was listed in a survey of landowners as having nine acres of built land. Besides Palmerston Road he also built on the roads off it, Ormond Road, Windsor Road, Cowper Road and built all of Killeen Road, named for his origins. He also had farms in Clare and one in Wexford which he bought to rescue a relative, something he did quite often. He was a hands-on worker who employed his own men and had to be persuaded down from a roof at the age of ninety! Patrick Plunkett moved into No. 14, Palmerston Road in 1865 and lived there for the rest of his life. His wife, Bess Noble, died in 1873 and he married again in 1879 at the age of fifty-eight and had four children. His second wife, Helena O Sullivan, was another cousin of Maria Cranny and Bess Noble. Plunkett was one of the few Catholic builders in Rathmines when he began and he found it difficult to get the services needed for his houses so he resorted to closing Palmerston Road to through traffic until the inconvenience persuaded the Rathmines Commissioners to give in. This was not his first argument with them. The Commissioners had been using the vestry of the Church of Ireland church on Belgrave Road for their meetings, effectively excluding the Catholic Commissioners but Patrick Plunkett led a group which entered the vestry with a ladder at the window and when word reached the House of Commons in London the practice of vestry meetings was ended. He became a Commissioner himself in the 1880’s and his sons, Oliver and Gerald were also Commissioners until Gerald was killed at the Battle of Galipoli in World War 1. In the early 1860’s the Ranelagh end of Marlborough Road was being developed, mainly by E. H. Carson, the same who had worked with Plunkett in Rathmines and who subsequently became a Pembroke Township Commissioner. Carson was building two-storey over basement redbricks on Marlborough Road, conventional type on one side and, on the other side, twelve houses similar to his houses on Warwick Terrace. 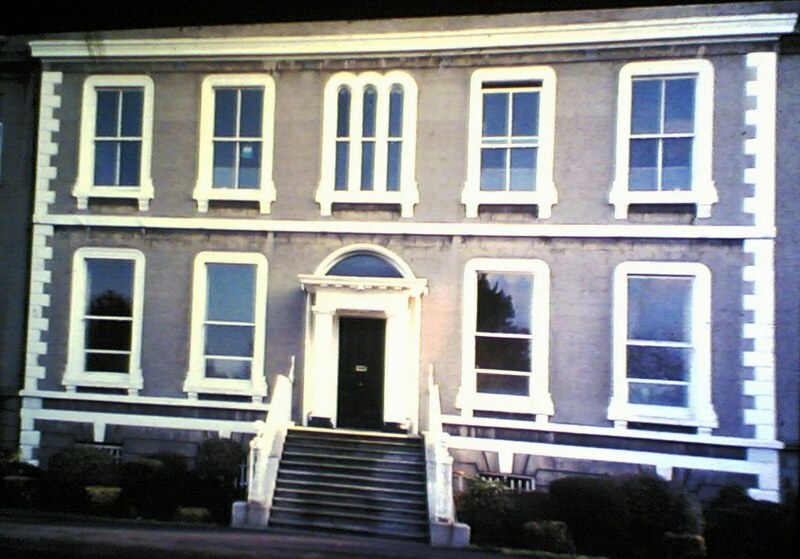 The first two of those twelve houses were commissioned by one of the Wrights whose family had had the hat factory in Donnybrook and the rest were built by and for E. H. Carson. Meanwhile Patrick Cranny was building again on the Pembroke Estate, on Elgin Road, Ballsbridge. In Dublin terms these are unusual houses, probably because they were designed by an English architect. Cranny built seven houses here in the prescribed designs; 26, 28, 32, 34, and 36 are three-storey over basement terraced houses and Nos. 38 and 40 are detached houses, two-storey over ground-level of fine proportions. 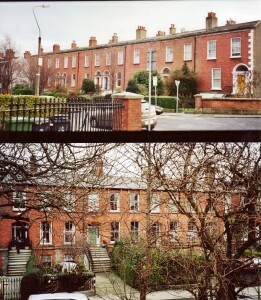 These seven houses were given to Patrick Cranny’s son, John Joseph, the doctor, as part of his marriage settlement in 1874 but he was already in such debt they had to be mortgaged straight away and those mortgages were not paid off until the 1950’s when the next generation were sorting out the property mess they inherited. No. 42 Elgin Road (not by Cranny) had stood next to the Cranny houses backing on to an equally fine house on Pembroke Road but both were demolished to make way for the building of the US Embassy. No. 18 Elgin Road with drawing-rooms the size of a small ballroom (not by Cranny but similar) was sold in 2008 for E12.5 million. 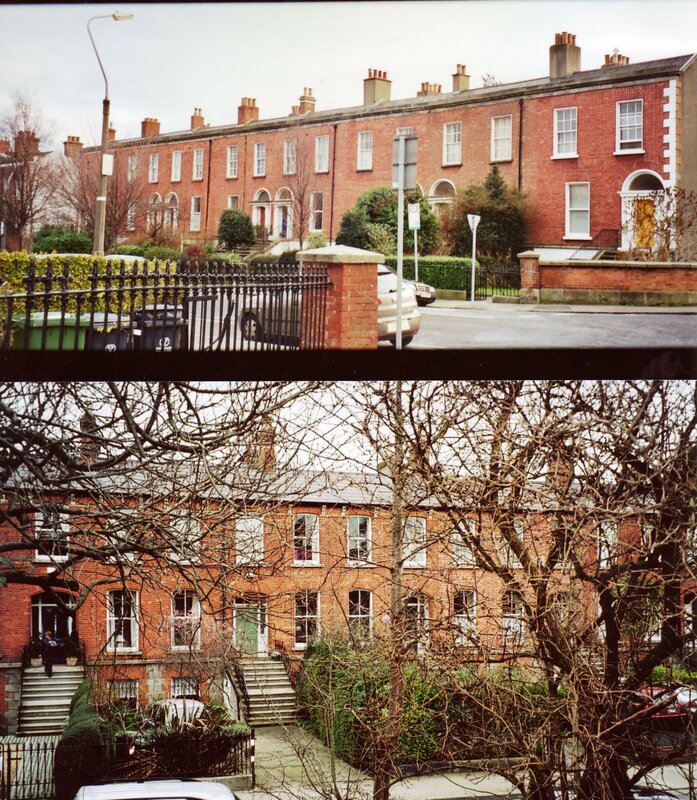 In the 1870’s Patrick Cranny began to fill in the gaps in the Donnybrook end of Marlborough Road with two-storey (13-25 odd) and three-storey (27-39 odd and 20-44 even) houses, working with his son, Gerald, the architect. The ground landlords for many of these were the Lynch family of Paris. Gerald may not have qualified as an architect, that was still rare, but he had the ideas and designs and was responsible for putting bathrooms with plumbing (but not hot water) into the houses, a new idea in Dublin. Geraldine Plunkett Dillon remembered her grandmother, Maria’s maid carrying huge basins of hot water up the stairs when Maria wanted a bath in 17, Marlborough Road (she had moved there after the death of her husband) the poor maid had to lay paper on every step first. The last house the Crannys built, No. 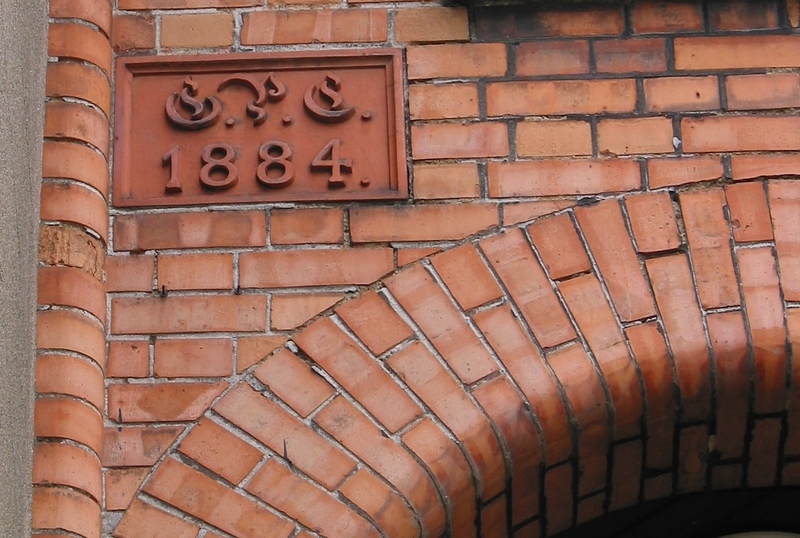 20, Marlborough Road has the date, 1884, and Gerald’s initials carved in the brick. 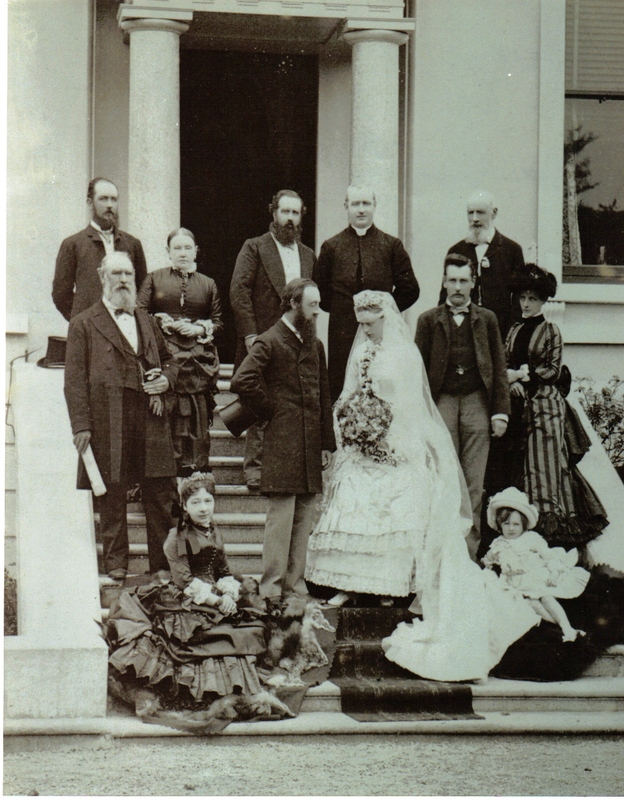 It was in June of that year that George Noble, Count Plunkett, son of Patrick Plunkett and Josephine Mary Cranny, who was the daughter of Patrick Cranny were married in Donnybrook Church and had their photographs taken on the steps of Muckross. The photographs include, besides the bride and groom, Patrick Plunkett and his second wife, Helena with their first child, Germaine, who was a bridesmaid, Patrick Cranny and Maria Cranny and their sons, John Joseph, Gerald and Frank who presumably was given permission to visit from Australia. In their marriage settlement Count and Countess Plunkett were given a terrace of eight houses (Nos. 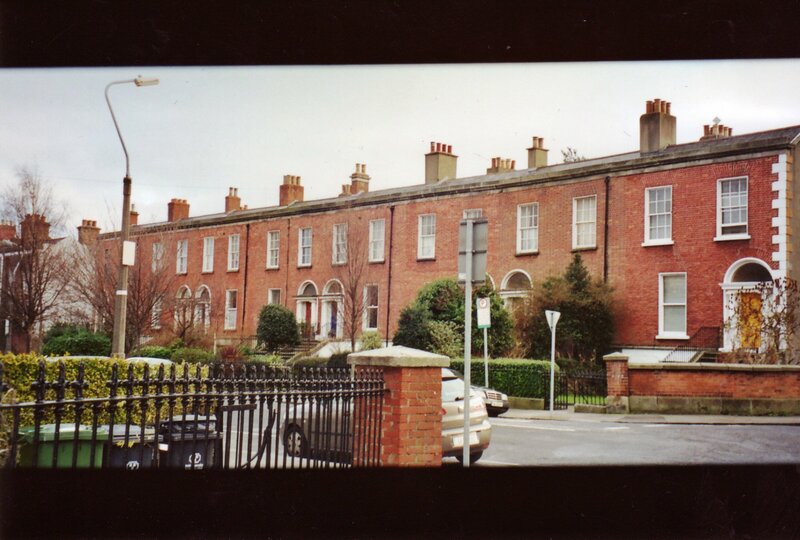 6-13) on Belgrave Road, Rathmines, a terrace of seven houses (Nos. 27-39 odd) on Marlborough Road, Donnybrook, a house on Upper Fitzwilliam Street (No. 26) and three farms in County Clare. Patrick Cranny built no more houses after this and he died in 1888, one year after his grandson, Joseph Mary Plunkett, was born. Joseph was executed as one of the leaders of the Rising in 1916. Gerald Cranny built two houses for himself on Eglinton Road, Donnybrook in 1883 but he gave them to his brother, John Joseph, when he left the country to become a wine merchant. He died in 1892 and left his share of the Cranny houses to his brother who exchanged some with his mother, Maria. This moving around of the property was a regular event but now, with the deaths of Maria in 1900 and of John Joseph Cranny in 1904, the Count and Countess became the owners of all the Cranny property which consisted mainly of 4 houses on Belgrave Road, 35 houses on Marlborough Road, 23 houses on Sandford Avenue off Marlborough Road, 8 on Elgin Road, 4 on Eglinton Road and ground rents in parts of these areas as well as the one on George’s Street. 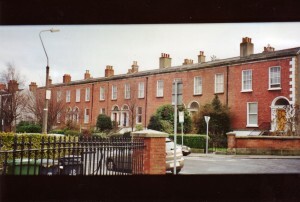 Many of the properties had restrictions such as being a life interest and therefore not saleable so Countess Plunkett also bought properties which took her fancy – the Hardwicke Hall, Hardwicke Street, 2 houses on Botanic Avenue, Glasnevin, a tenement and some cottages on Abbey St. and the mill manager’s house with farm buildings, barn, milling house and some land, Larkfield in Kimmage. The houses played a small part in the history of the State: gelignite in the garden of one, motorbikes and cars for Michael Collins stored in another, the author of the British Army Manual that was part of the 1916 Rising plan lived in one on Marlborough Road, the Irish Theatre began in the Hardwicke Hall, Larkfield was refuge and training camp for the Liverpool men who came over for the Rising and Joseph Mary Plunkett lived in No. 17, Marlborough Road. In 1926 the Plunketts moved from No. 26 Fitwilliam Street where their seven children were born to No. 40, Elgin Road and later to Ballymascanlon in County Louth. Countess Plunkett died in 1944 and Count Plunkett in 1948. Only three of their seven children survived them and they, their children and their nieces and nephews inherited what was left of the property which had been badly mismanaged, particularly by Countess Plunkett who had taken the task on herself, and, after the foundation of the State and the departure of the British civil servants, it was of very little value. In a poor economy the houses were difficult to maintain or improve and nearly impossible to sell so most of them became rental accommodation and in better times were sold off. 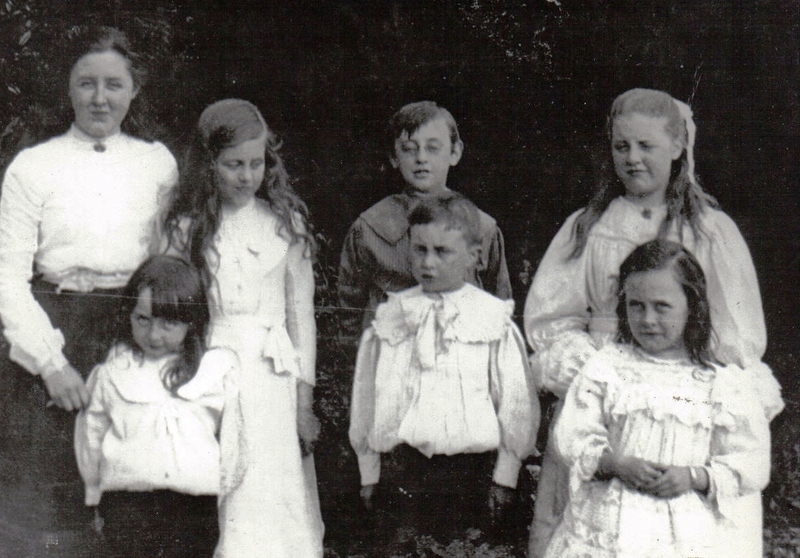 Initially many of the houses were lived in by members of the family so in the 1960’s there were eleven branches of the family living on Marlborough Road, making it possibly the only tribal, suburban road in Ireland!